This article will run you through your Cash Register Settings, so you can customise how your Point Of Sale (POS) system in your Simple Inked account. Setting up your Cash Register Settings. Go to Settings and click on Cash Register Settings. When you select any of these options a tick will appear in the box next to it, and very importantly you need to click Save when you have finished, to ensure the changes are updated. Re-book Reminder Enabled - tick this if you would like a rebook reminder to pop up after the clients transaction. Re-Book With Applied Discount - if there is a current special discount offer and you would like to apply that to the clients next appointment, you can tick this option. Receipt Printer Attached - allows your Simple Inked to connect to a printer. Printer can be a USB connected receipt printer or a regular A4 printer. Force Operator At Sale - allows you to appoint and select a particular operator in your point of sale page, if you are selling a particular product or service. Auto Scan - the scanning option will automatically come up at point of sale, this is great if you regularly scan items. Payment Gateway For Credit Cards - You can tick this to set up your Stripe connection to take Credit Card payments via your POS screen without the use of an EFTPOS machine. 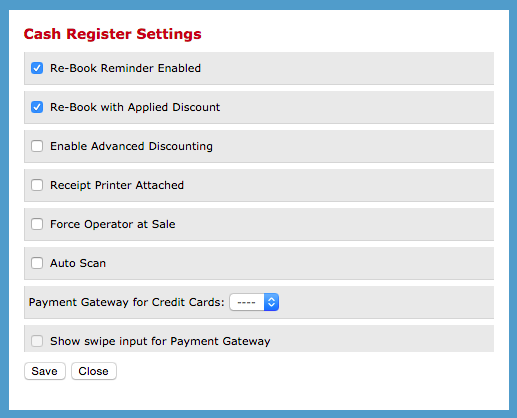 Show Swipe Input For Payment Gateway - tick to default to swipe machine input for payment gateway at POS. Scroll down in your Cash Register Setting screen to continue on. Enable Tips - Tick this setting to turn on Tips in POS. 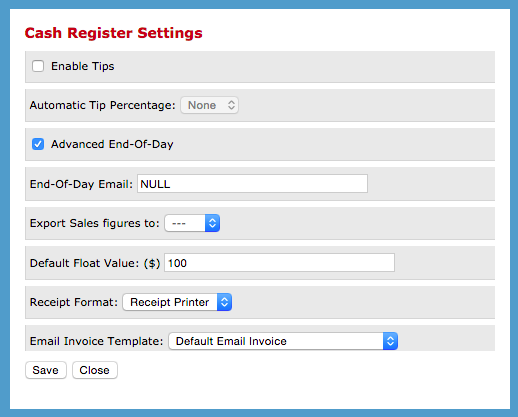 Advanced End Of Day - This allows you to balance your till at the end of the day (and breaks down all the different payment methods) Also you can run a comprehensive End of Day Summary Report to keep track of how your business sales are going. End-of-Day Email - This is the email address you would like your End of Day Summery Report emailed to. Default Float Value: ($) - This is the figure you would like to keep in your till as a float for the next days trading (i.e $100). So at the end of the day when your finish the End of Day Process it will automatically reset to this value. Receipt Format: - This enables the formate you have chosen for for printing receipts, either A4 or if you have a specialised receipt printer. Auto Email Invoice - if you tick this, at the end of the transaction the system will automatically email the client their receipt. 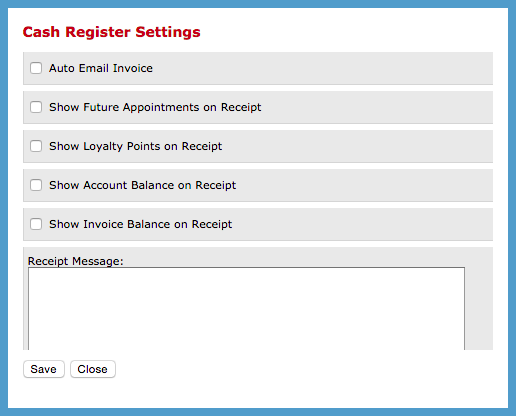 Show Future Appointments on Receipt - Will show the customer their next appointment on their receipt. Show Loyalty Points on Receipt - If you have a Loyalty Points Program, you can tick this option and clients will be able to view their Loyalty Point total on their receipt. Show Account Balance on Receipt - You can choose to have the clients account balance displayed on their receipt, this can be a negative or positive amount depending on wether they are owning an amount, or if they have credit. Show Invoice Balance on Receipt - Tick this to display the clients remaining amount which is to be paid off of their outstanding invoice. Receipt Message -You can enter what message you would like your clients to see on their receipt (at the bottom of the receipt).